Follow These Bike-Vehicle Collision Prevention Guidelines | Phoenix Personal Injury Law Blog - Breyer Law Offices, P.C. If you’re a motorist, chances are you frequently forget about the dangers of being involved in a Show Low bicycle accident. And although there are not as many cyclists on the road as there are in other parts of Arizona, like Phoenix, there is still the risk that you will be involved in an incident on the road with a cyclist if you are not careful at all times. These incidents are more common than most people believe, and if you’re one of the “guilty” parties that forgets to look for cyclists before changing lanes or going through stop signs, then it’s time for you to review these top five tips for sharing the road so that you can avoid injuring another traveler in a serious accident. Remember that the bicycle lane is for bicycles and treat it as off limits to your vehicle. One of the most common causes of bicycle accidents is that some drivers do not give the bicycle lane the respect it deserves. Many motorists pull into the bicycle lane to make a right hand turn long before the bicycle lane turns into a shared lane. Others pull off the road into the bicycle lane or use it as a place to stop and park, making it impossible for cyclists to remain safe and in their own lane of traffic. Others still swerve into the bicycle lane to avoid other hazards on the road, forgetting that this area is no longer the shoulder of the road. Give cyclists room on the road. There will not always be a bicycle lane, but there will be cases where a cyclist near you needs to move out into traffic. Give cyclists the same respect on the road that you would give other drivers, and with more caution. Look behind you before making a right hand turn. At stop lights especially, looking behind you to the right can help you to better see cyclists that may be in your blind spot. Do not tailgate cyclists. Remember that cyclists have the same right to the lanes of traffic that you do, but they cannot move as fast. Give cyclists around you the opportunity to move to safety so that you can pass them by. Never move around a cyclist in the same lane of traffic. Although a bicycle is a small vehicle, it still legally has the right to the full lane of traffic. Never try to pass a bicycle while still in the same lane of traffic. 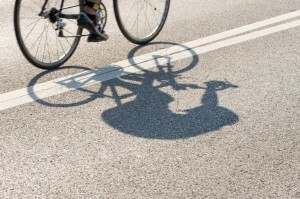 Remember, as a motorist, you have the power to prevent serious incidents with cyclists. Share the road and pay attention to keep everyone safe from harm.